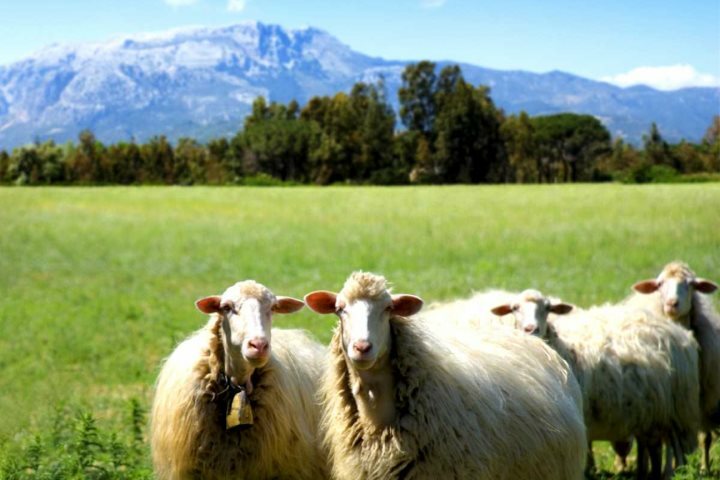 The millions of sheep that graze the vast stretches of meadows throughout Sardinian are an iconic feature of the landscape. They are farmed in much the same way as they have been for hundreds of years, spending the summer in the cooler mountain pastures, coming down to low lying pastures each autumn. The sheep’s milk cheese, Pecorino, is without doubt the most famous of the island’s cheeses; most notably, pecorino sardo, pecorino romano and fiore sardo. All three are recognised by the European Union as Denominazioe di Origine Protetta (DOP or Protected Designation of Origin) products. If you buy an Italian cheese with the DOP label you know you are buying a local delicacy, recognised to come from a particular region, made by artisans, using traditional methods, and not an imitation. There are two types of pecorino sardo. Pecorino sardo dolce, which should be eaten within a month of it being made. It is mild and creamy and perfect for a pasta cheese sauce, as it melts easily. Pecorino sardo maturo, which has been matured from 2 months to a year, is harder and has a stronger flavour - perfect for grating over pasta or as an accompaniment to a glass of red wine. This is made in both Lazio and in Sardinia and, is one of Italy’s oldest cheeses. Dating back to Roman times, it has been a popular export for many centuries. It has a strong slightly nutty aroma, a crumbly texture and a salty, smoky taste with a touch of spice. It is aged from between eight months to a year, with the smoky flavour intensifying over time. It is perfect for grating over pasta and pairs well with a light beer or a full bodied Italian red wine. Fiore sardo may be even older, and is said to date back to the Bronze Age. It is one of the most distinctive of pecorinos, being fruity, nutty and salty in flavour, with a touch of caramel sweetness. It is aged for several months and may be smoked with herbs, and as it ages the flavours intensify. This young cheese pairs well with young reds, such as Cannonau di Sardegna, while the acidity of the more mature fiore sardo pairs well with a Malvasia di Boca DOC, an intense, slightly bitter white wine. In contrast, pecorino gran cru, is a new cheese born from a collaboration between the food company, Academia Barilla, and a cooperative of hundreds of small sheep farms in the hills above Sassari in northwest Sicily. In these farms, the sheep graze on wild herbs and grasses, producing a well-rounded, caramel flavoured cheese. It is possibly the finest of all the pecorino cheeses. The most pungent of all the pecorino family of cheeses is casa marzu (pecorino with maggots), and the aroma of ammonia is overpowering. It’s produced by an advanced level of fermentation, as the fats in the cheese break down thanks to the maggots of the cheese fly, and it’s certainly an acquired taste! Although it is still produced, this cheese is now illegal due to health concerns, particularly if you eat the cheese with the maggots still in it. Definitely not one to take home with you! 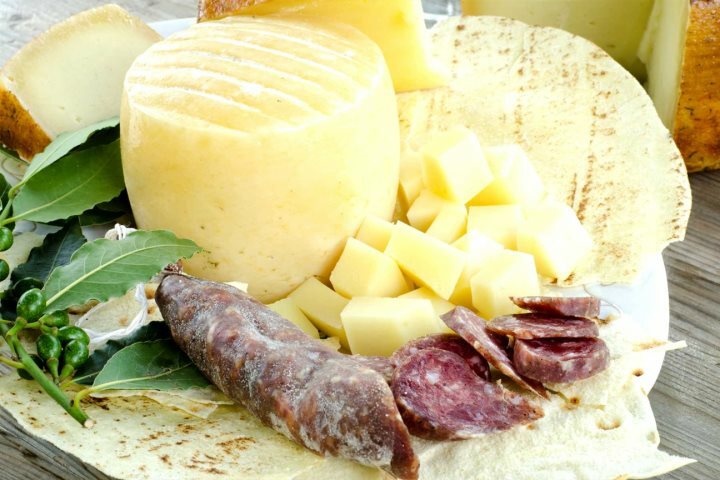 Many localised cheeses are produced that are well worth hunting down, including the goat’s milk cheese caprine, the cow’s milk cheese casizolu, and a variety of ricottas made from cow, sheep or goat’s milk. The strong summer sun, fragrant pastures dotted with Mediterranean herbs and the traditional production methods still in use today, all contribute to the uniqueness of Sardinian cheese. 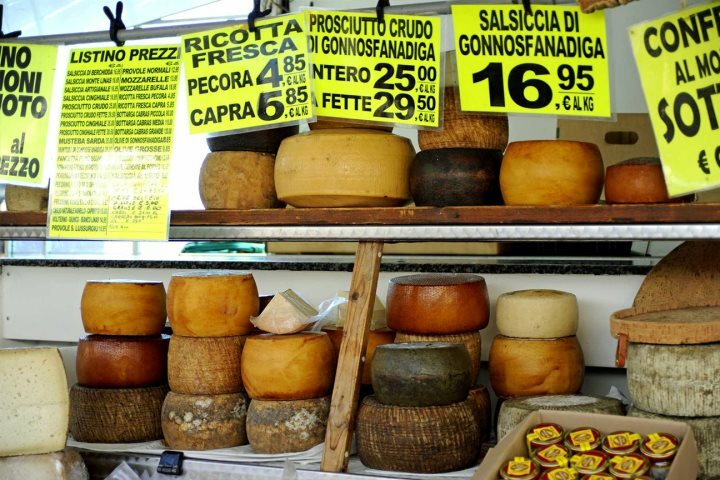 Next time you are on holiday on the island, be sure to visit a farmer’s market and pick up some local cheeses. Read our blog post Best Buys at a Sardinian Farmer's Market for more ideas of what to look out for.